Copywriting. Its Critical Role In The Success Of Your Web Site. "As Much As Things Change They Stay The Same." The Web is something we R.. E.. A.. D.. Although it (the web) has many wonderful and amazing "gadgets" we human beings still primarily gather our information through our dominant senses. So, what's a dominant sense you ask? Well, interestingly enough our dominant (most used) sense changes with each of us. Some of us have a number of dominant senses. Essentially our dominant senses are our "seeing" .. "hearing" .. "touching" and "feeling." Culturally we have been taught to retrieve information by SEEING.. reading, watching, viewing. All our other senses play a secondary role in our information retrieval process (learning.) They turn the information into 3D format if you like. However, our primary sense is SEEING.. thus, the R E A D A B I L I T Y of your web site is critical to your online success. In English speaking cultures we read in a "Z" fashion. So, why is this information important to the functionality and commerciality of your web site? Well, it has been found that there are three POWER POINTS points for information in an advertisement. It's the eye following the "Z" curve, as it's called. Now, there's all that other stuff you've being hearing about. The brain gathers information using our senses. We read using a "Z" curve. There are key information points on the curve. The brain attempts to organize information by cross-referencing what we already know, like, understand and value. The brain's first question of itself when it encounters new information is "What Is It? If it (the brain) can't find that information very quickly - in the context of your web site - it says to its owner (the surfer) "This information is to hard. I don't know what it is, or of what value it is to me... click NEXT." So, How Brain Friendly Is Your Site? Everywhere you look you'll find the the skill of the copywriter. The list is endless. We're swimming in a sea of words... Good words, bad words... words that sell us things... words that motivate us to do something... words that anger us... words that make us laugh, cry, fall in love... BUY SOMETHING. AND... who's behind all these words? AND... they're ALL selling us something... an idea, a product, a thing, an emotion. for the success of your web site? Hire someone to write the copy for you. It's as simple... and as important as that! You've got TEN seconds to GRAB a visitors attention. You just have to have GOOD copy on your web site. Option One - Get Good At Copywriting. AND... How do you know who's worthy of respect? because their words have sold a lot of stuff ($M) for clients. Read what they have to say about the subject. Option Two - Hire A Copywriter. If you don't feel confident about your ability to write - even with the guidance of a mentor - then you can always hire a copywriter to do it for you. Both of these sites are respected for the quality work of their copywriters. These above are some of the basic understandings related to web copywriting. 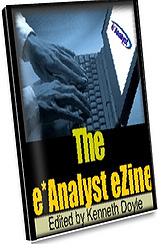 If you're interested in running a business on the web, then subscribe to The e*Analyst ezine, where this subject will be discussed in greater detail. -------->> T E S T I M O N I A L <<-------- Just thought I would drop you a note and let you know how much I enjoy your informative ezine. I rarely find time to read over as many ezines and I would prefer to. However saying that - after reading a few issues of the e*Analyst - I eagerly await my copy and usually learn a new trick every time I read your latest copy.